Our range of diligent ratio fully electronic system to set the profile for attaining the desired air / fuel ratio for proper combustion with specified excess air. 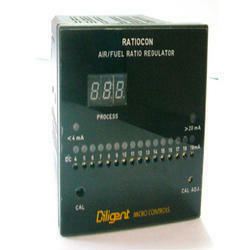 Ratiocon works on either 110 v or 230 v +/-10%, 1 phase ac supply. Proper combustion of fuel needs adequate proportions of air and fuel which is known as Stoichometric Ratio. However, in working conditions, this proportion does not remain same due to various physical parameters that are linked with the burner and its components, such as blower and fuel pump. Our product is useful in marinating this proportion which is crucial to efficient combustion of fuels. Earlier, this was achieved mechanically by using adjustable profile cams. Each cam corresponded to different operating point and was attuned for specified air/fuel ratio to ensure proper combustion. Looking for Electrical Regulators ?